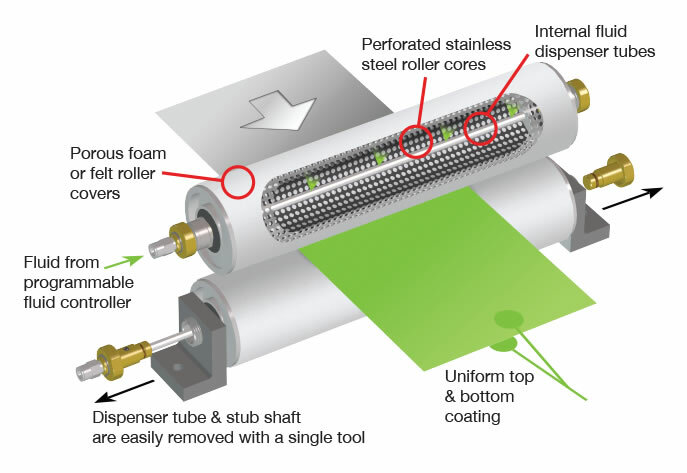 The Powered Uni-Roller® system features a DC gear motor drive and Unist’s proven internally-supplied rollers which apply the exact amount of fluid needed to lubricate blanks stock when combined with an SPR-2000™ or SPR-2000-JR™ programmable fluid controller. Neat application – No fluid mess! Reduces fluid usage – Saves money! Powered Uni-Roller® for stock Up to 18″ (457mm) wide: Compact drive arrangement and single roller design fits in limited spaces. Comes with a 1/17 horsepower DC gear motor that directly drives the lower roller at speeds up to 200 ft. per minute (61 m/minute). Powered Uni-Roller® for stock wider than 18″ (457mm): uses a timing belt to drive the lower roller at speeds up to 145 ft. per minute (44 m/minute). Each system features multiple 12″ (305 mm) rollers that are staggered and overlapped. This design controls the lubricant application in zones and allows unit sizes beyond the maximum 58 in. (1422 mm) standard width. That’s what many of our customers report. By applying the proper amount of fluid, the Uni-Roller® lubricator uses 50 to 90% less lubricant. Plus it decreases the mess, the parts cleaning, fluid recycling and costs associated with in-die spray systems, rag technology and externally lubricated rollers. Powered Uni-Rollers™ are available in the following widths: 6″ (152 mm), 12″ (305mm), 18″ (457mm), 23.5″ (597mm), 35″ (889mm), 46.5″ (1,181mm), 58″ (1473mm) for stock widths over 58″, contact us!